As we discussed here, the All For Transportation Hillsborough County Charter Amendment cloaks itself around transportation and safety improvements, while deceptively and intentionally constraining road capacity and thus increasing congestion. They are intentionally downplaying their true advocacy for transit, specifically fixed guideway or rail solutions. Yet those will be an even bigger failure than their so called transportation improvements. First, the transit related sections from the plan. Cited directly from the plan, this section allocates over $7 billion, or 45% of the estimated $16 billion in total funds raised over 30 years, directly to HART. (1) Enhancing Bus Services. No less than forty-five percent (45%) of the Transit Restricted Portion shall be spent on bus services, including express, neighborhood, circulator, paratransit, and all other types of transit now or hereafter operated by HART. HART shall consider the following factors in determining the projects included in its Project Plan for this purpose: existing transit ridership; increasing existing service; expanding service to more residents; existing and future land use; and the availability and feasibility of obtaining third party funding sources to fund any portions of the Project Plan. Cited directly from the plan, this increases funding for expanding HART bus related services. That is, what it does today, to nearly $3.2 billion, or 20% of the total tax over 3 years. Note what appears to be a scope expansion for HART or "existing and future land use", which is not explained elsewhere. Is that for right of way acquisition, or is that for transit oriented development? (2) Expanding Public Transit Options. No less than thirty-five percent (35%) of the Transit Restricted Portion shall be spent on transit services that utilize exclusive transit right-of-way for at least seventy-five percent (75%) of the length of the applicable service. HART shall consider the following factors in determining the projects included in its Project Plan for this purpose: existing transit ridership; utilizing or extending existing fixed guideways and rights-of-way; increasing existing service; expanding service to more residents; existing and future land use; and the availability and feasibility of obtaining third party funding sources to fund any portions of the Project Plan. Cited directly from the plan, this is nearly $2.5 billion, or nearly 16% of the total taxes over thirty years. "Utilize exclusive transit right-of-way" specifically will require rail and/or dedicated transit lanes. (3) Remaining Funds. Any remaining portions of the Transit Restricted Portion shall be spent on any project to improve public transportation permitted by F.S. § 212.055(1) or this Charter. Cited directly from the plan, this is about $1.4 billion, or 9% of the total revenues, which can only be reallocated to "public transportation" parts of the plan, i.e., sections (1) and (2) above. 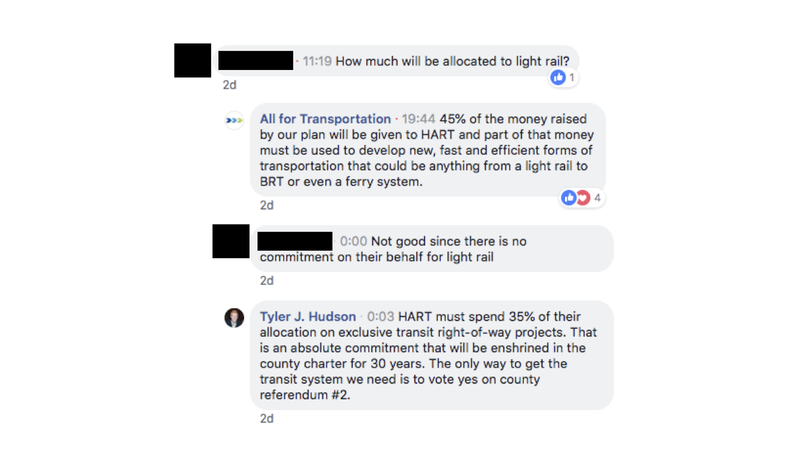 The Tampa transit advocates who authored the plan were careful to ensure monies from the "General Purpose" section of the plan could flow to transit, but that monies allocated for transit were locked into transit. 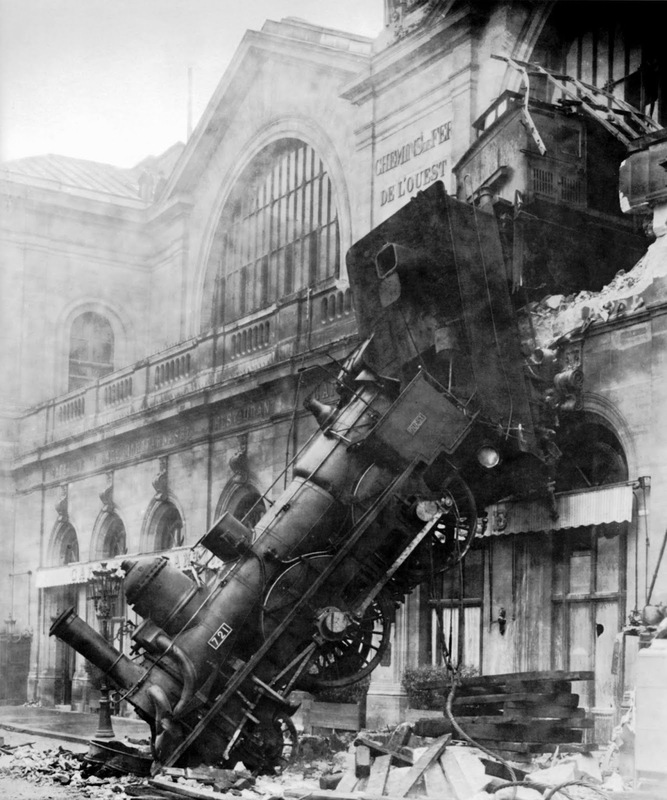 The plan is a hail mary to dying transit. Transit ridership is falling throughout the US. Reports are common throughout the mainstream media as well as urbanist, transit advocate and libertarian sources. All modes - commuter rail, light rail, bus are affected. Legacy transit cities are as affected as are newer ones. There are several reasons - ride sharing, improved economy, lower gas prices, more telecommuting. It does not really matter that much. Transit nationally has never had a major share of commuting outside of New York City, and cities such as Tampa, without a large central business district, are not conducive to transit. Regardless, when people have a choice, most chose not to use transit. Even during the great recession, when transit ridership reached its recent high ridership, it was not that great. Hillsborough is no exception. From FY 2016 to 2017, HART''s weekday ridership to date had decreased 7.7%. This is on top of the decrease in ridership of 6.5% from FY 2015 to 2016. That adds up to an average daily loss of 6831 riders in Hillsborough County, which grew an estimated 100,000 new residents during those years. The residents in Hillsborough have not been choosing HART. They have been choosing to drive their cars. Even if we had a more developed transit infrastructure as AFT is proposing, it will not get you to where you want to go faster than driving. According to Governing magazine, riding transit takes nearly twice as long as driving. That holds true even in New York and Los Angeles and other transit heavy municipalities nationally. Despite all the transit investment, driving is still faster. Twice as fast. To believe that the AFT will do any better with Hillsborough any time soon is a foolish game. Regardless, Hillsborough, we are told, is the definition of sprawl. Who am I to argue? Well, the best way to get around, and get to a job, has been, and will be, by car. Studies show that car commuters have about 30 times more job accessibility than those who take public transit. Spending billions on transit will be of little to no help for those who need improved access to their jobs, and the choice of better jobs. Then there is just the fact of the large numbers of 700,000 new residents moving into Hillsborough in the next 30 years. Hillsborough population will grow from 1.4 million to 2.1 million. Even if AFT was wildly successful and more than quadrupled HARTs ridership to 8% of commuters (which has not happened in any transit agency over the last 30 years), there will still be over 1.9 million people in Hillsborough driving cars daily, or an increase in over 500,000 more people in cars. Transit is unable to respond to this demand especially when HART is currently averaging less than 43,000 riders per weekday. We must anticipate the need for new road capacity, which current residents clearly prefer and future residents will as well, which this plan explicitly underfunds (if at all). In fact, HART has NO PLANS to spend this kind of money. This plan funds HART at over $126 million in 2018 equivalent, or about 4 times what they are funded today with Ad Valorem taxes. They have little in the way of vetted plans or designs for the type of transit corridors planned by AFT. Sure, HART has it's Ten Year Development Plans (TDP) and aspirational plans, but those are nowhere near "shovel ready", and much more modest than AFTs vision. It will take years for HART to study, design, plan, assess environmental impacts, perform economic studies, comply with land use, acquire right of way, etc. before a single track is laid. Don't believe me? It took 7 years for Sunrail in Central Florida to become operational after the counties approved the project, and which required little new rail development as they acquired the rail from CSX. The result, of course, was paltry ridership, around 3400 per week day through June 2018. In the mean time, those 700,000 new residents will keep piling in with their cars. Which, of course, are all in city of Tampa. The most expensive forms of transit is serving less than 30% of Hillsborough population, while being paid for by the other 70% who live, work and play in the county. Not only that, these rail corridors -- downtown, Westshore, airport, USF -- serve the wealthiest neighborhoods with the shortest commutes in Hillsborough. Even if these 4 rail lines regularly served an unreasonably optimistic 10% of the population of Tampa, that is only 37,000 people out of a county of nearly 1.4 million. This is a bad investment in mobility. Not to mention the regular commuters and visitors from nearby Pinellas, Pasco, and Polk counties will see no benefit. Pasco in particular is growing at an even faster rate than Hillsborough, further pressuring Hillsborough's transportation infrastructure, which this plan does nothing to relieve. AFT already restricted me from commenting on their Facebook page after I cited clauses in their plan and the implications. Now I expect they will block me completely. When more Americans telecommute than take transit, perhaps we've reached the event horizon on the black hole of transit. The AFT plan attempts to bail out dying transit and HART with ill conceived plans for a relative few in Tampa, that will take years to develop, and will result in commutes twice as long than driving. Time to stop the wishful thinking, and deal with the reality we live in Tampa Bay. Updated 10/10 - added missing link.